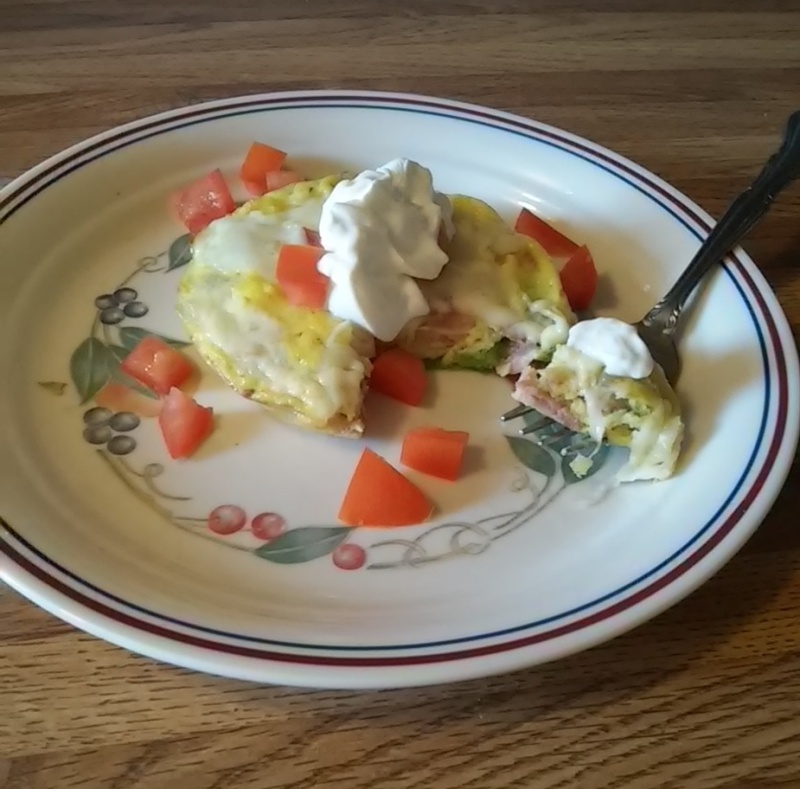 What a great way to incorporate some veggies at breakfast time! Feel free to use whatever vegetable you have on hand. I used frozen over fresh green beans because frozen vegetables tend to cook in a fraction of the time compared to fresh. You could also use breakfast sausage, ham or any type of ground meat. This would also be great with asparagus, bell peppers, and with added jalapeno and even spinach. This recipe serves 2 but feel free to double or triple the recipe to feed your family. The main difference will be how long it takes to finish cooking in the oven. Be sure to serve it with tomato and sour cream (if you can have dairy), they really compliment this frittata well! Note: If cooking the bacon prior to preparing the recipe, just be sure to pour off all but 1 tbsp. of the bacon drippings. I hope you enjoy and thanks for sharing! Preheat oven to 350 degrees F. Heat a small skillet over medium heat. Add bacon drippings, green beans (fresh or frozen), onions, 1/8 tsp. of salt, garlic powder, pepper and Cayenne. Cook for about 5 minutes, stirring occasionally. While green beans and onions are cooking, add the remaining salt to the eggs and blend well. Serve with sour cream and fresh diced tomatoes. *Be sure skillet is oven proof. Nutrition: 400 Calories, 31 grams Fat, 7.5 Total Carbs, 2.5 grams Fiber, 5 grams Net Carbs, 25 grams Protein. Note: Fat content and protein will vary based on bacon used. Ooo I have some ham & asparagus. I think this will be tomorrow’s breakfast! Can’t wait to try it!!! This is a winning recipe, Melissa! I did use asparagus and ham instead of beans and bacon. Sauteed onion and asparagus using coconut oil. Then I portioned out two into mini-pie plates to bake. It took about 12 minutes to bake this way. The result was breakfast for this morning and another one for tomorrow! This is absolutely delicious and so easy to prepare!!! Delicious! I used butter, and leftover chicken instead of bacon. I picked some Kale from the garden, and then threw in a jalapeno. I used shredded parmesan to top it off. This is going onto our weekend breakfast rotation for sure :).